Freddie Mercury, original name Farrokh Bulsara, (born September 5, 1946, Stone Town, Zanzibar—died November 24, 1991, Kensington, London, England), British rock singer and songwriter whose flamboyant showmanship and powerfully agile vocals, most famously for the band Queen, made him one of rock’s most dynamic front men. Bulsara was born to Parsi parents who had emigrated from India to Zanzibar, where his father worked as a clerk for the British government. Influenced by the hard-edged, blues-based style of rock acts such as Cream and Jimi Hendrix, Bulsara began singing with bands in London. He also became friends with guitarist Brian May and drummer Roger Taylor of the band Smile, and in 1970, when Smile’s lead singer quit, Bulsara replaced him. 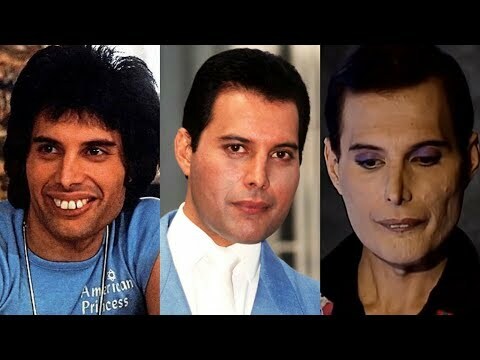 He soon changed the group’s name to Queen and his own to Freddie Mercury. Bassist John Deacon joined the following year. Incorporating elements of both heavy metal and glam rock, the band debuted on record with Queen (1973), which was followed by Queen II (1974). Despite an impressive blend of majestic vocal harmonies and layered virtuosic guitar work, Queen initially failed to attract much notice beyond the United Kingdom. The album Sheer Heart Attack (1974), however, shot up the international charts, and A Night at the Opera (1975) sold even better. The band’s ambitious approach to both songwriting and studio production was epitomized by the latter album’s mock-operatic single “Bohemian Rhapsody,” one of a number of Queen compositions written principally by Mercury. The song spent nine weeks atop the British singles chart, and its accompanying promotional film helped the music industry recognize its future in video. Spectacular success followed in 1977 with “We Are the Champions” and “We Will Rock You”—which became ubiquitous anthems at sporting events in Britain and the United States. Although Queen’s commercial fortunes had begun to wane by mid-decade, the band arguably reached its apotheosis as a live act with a stellar performance at the charity concert Live Aid in 1985. That same year Mercury released the solo record Mr. Bad Guy, which took musical inspiration from disco. Mercury later appeared on the sound track of Dave Clark’s science-fiction musical Time (1986) and teamed with Spanish soprano Montserrat Caballe for the semi-operatic album Barcelona (1988). In 1991 Mercury, who had engaged in relationships with both men and women, announced that he had been diagnosed with AIDS. He died a day later from complications related to the disease. Until shortly before his death, Mercury had continued to record with Queen, and he was posthumously featured on the band’s final album, Made in Heaven (1995). Bohemian Rhapsody (2018 biographical film about the British rock band Queen) has grossed over $401 million worldwide on a production budget of about $50 million. It is the highest-grossing musical biographical film of all time. The film received mixed reviews from critics; its portrayals of Mercury's life and sexuality and of the other band members were criticised, but Rami Malek's performance and the music sequences received praise. Several historical inaccuracies were also highlighted. Queen's Greatest Hits (released worldwide on 26 October 1981) was an instant success, peaking at number one on the UK Albums Chart for four weeks. It has spent 833 weeks in the UK Charts, and is the best-selling album of all time in the UK, selling over six million copies. It is certified eight times platinum in the United States, and is Queen's most commercially successful album worldwide with over 25 million copies sold, making it one of the best-selling albums of all time. Radiohead guitarist Ed O'Brien hailed the UK edition of Greatest Hits as "impeccable" and "absolutely genius", while British journalist Brian Viner called it the greatest album of all time.